Closing gaps in health service coverage, quality and equity requires the conceptualization, testing and implementation of innovative business and organizational models, operational or production processes, products, and services to prevent childhood and maternal deaths. 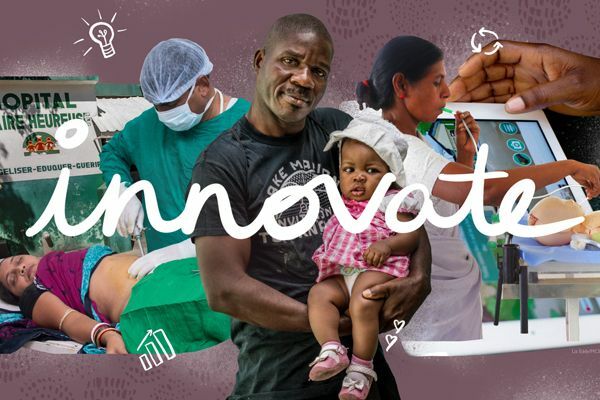 Innovation helps low- and middle-income countries rapidly make progress towards reproductive, maternal, newborn, child and adolescent health and development targets. MCSP is building on work started under USAID’s predecessor Maternal and Child Health Integrated Program (MCHIP) to continue supporting expansion of the evidence base for innovative approaches, and facilitating locally-owned and context-sensitive adaptation of these life-saving innovations. Uterine Balloon Tamponade: In settings without timely access to high-quality comprehensive emergency obstetric and newborn care, the uterine balloon tamponade can be lifesaving when other interventions fail to stop postpartum hemorrhage (PPH). Bubble Continuous Positive Airway Pressure: This strategy provides low-income countries with a simple, low-cost method of reducing the 20-38% percent of neonatal deaths due to respiratory failure. Reaching Every Community / Quality Improvement: Addressing equity gaps among communities is essential to improving national coverage of routine immunization. Building on the globally accepted Reaching Every District strategy, Reaching Every Community / Quality Improvement focuses on equitable coverage via quality improvements processes, data-driven strategies, and ownership at the local level. Possible Serious Bacterial Infections Guidelines: Making antibiotic treatment simpler, easier to access, and more acceptable to families in resource-limited settings would dramatically reduce the nearly 420,000 annual newborns deaths due to infections every year. These guidelines provide community health workers with evidence-based recommendations to identify serious infections and to use simple, safe and effective antibiotics rather than solely resorting to referral of hospital treatment. First Time/Young Parents: Programs that neglect young parents and adolescent reproductive health can integrate the MCSP First Time/Young Parent Model into health systems, improving the quality of health services necessary to prevent the 16 million unintended pregnancies among girls 15-19 years of age each year. For part of the Model, MCSP adapted Save the Children’s My First Baby Guide to improve maternal and neonatal outcomes of married, pregnant and parenting adolescents. One of the most significant adaptations was to approach first-time parenting with a gender-focused lens to increase male involvement and couples communication, and address gender norms. Gestational Age Estimation: Precise estimation of gestational age and estimated date of delivery—regardless of resource level—facilitate appropriate birth planning and complication readiness. They also improve the capacity to provide appropriate, time-sensitive interventions for improving maternal and newborn outcomes in the context of both antenatal and intrapartum care. Our ultimate goal is to have MCSP-supported countries contribute to progress related to each — from development and introduction of these innovations, to full scale-up. To download MCSP’s innovations fact sheet, click here. Shared emerging research related to safety and efficacy of the uterine balloon tamponade in PPH management. Multiple MCSP/MCHIP country program representatives participated in the resulting virtual exchange, sharing their country-level experience with introducing and implementing the uterine balloon tamponade within their particular health systems (including Mozambique, Rwanda and Bangladesh). In Uganda, MCSP supported the Ministry of Health to incorporate the Reaching Every District (RED) Categorization Tool into District Health Information System 2 — a web-based, open-source system to collect, manage and analyze data — which will allow managers at all levels to have instant access to information about health facilities/districts for decision-making purposes. Additionally, MCSP convened a forum of district leaders to review performance and share experience, resulting in commitments from districts to continue implementing RED quality improvement processes. In Nigeria, MCSP convened a 5-day workshop to integrate possible several bacterial infection into the Essential Newborn Care Course (ENCC) and Integrated Management of Childhood Illnesses (IMCI) training curricula. The updated IMCI curriculum was field tested, revised and finalized. The ENCC curriculum will be finalized in early 2018. MCSP completed a formative research on factors that influence adolescents’ intention to seek services and use antenatal care, postnatal care, and family planning services at relevant times in their reproductive lives. The Madagascar team has since engaged national and local stakeholders in a human-centered design workshop, using these study results to inform development of the first iteration of a first time/young parents model for the country. The model has been reviewed and vetted by health workers — including community health workers — in Menabe. As part of a first time/young parents program in Mozambique, MCSP completed the pilot implementation of “Our First Baby” for young pregnant women and their partners in six districts: three in Nampula; and three in Sofala. The facilitators (community health agents) were supported by both MCSP and district health office staff to track attendance and follow-up with participants. In Sofala, the groups had a retention rate of 100%; in Nampula, consistent attendance was lower, with only 62% of all young women and men who enrolled completing all 9 sessions. In Nigeria, data collection and analysis were completed and a report was drafted for a formative study on first time/young parents. MCSP shared the findings at a panel at the International Association for Adolescent Health Congress in Delhi in October 2017. A workshop is planned for early 2018 to adapt the “Our First Baby” curriculum to the Nigerian context. Efficacy of administration of IPTp (intermittent preventive treatment in pregnancy with sulfadoxine-pyrimethamine) to prevent malaria during pregnancy relies on accurate gestational age estimation. At the end of 2017, MCSP widely disseminated the “Toolkit to Improve Early and Sustained Uptake of Intermittent Treatment of Malaria in Pregnancy,” reaching multiple maternal health and malaria special interest groups, researchers and implementers. The toolkit is available in English, French and Portuguese. In India and Cambodia, MCSP is conducting quantitative and qualitative research to strengthen the accuracy, precision and use of gestational age data to inform the delivery of time-sensitive clinical interventions.